After a two week delay Shuttle Endeavour launched on its final mission this morning from Kennedy Space Center in Florida. The Shuttle crew for STS-124 has gone into orbit with a Star Trek-themed mission poster and a crewmember who has appeared in Star Trek. Watch the launch and check out the poster below. After a delay of a couple of weeks, Shuttle Endeavour launched successfully on its 25th and final mission at 8:56 EDT. The crew members for space shuttle Endeavour’s STS-134 mission are Commander Mark Kelly, Pilot Gregory H. Johnson and Mission Specialists Michael Fincke, Greg Chamitoff, Andrew Feustel and European Space Agency astronaut Roberto Vittori. During the 16-day mission, Endeavour and its crew will deliver the Alpha Magnetic Spectrometer (AMS) and spare parts including two S-band communications antennas, a high-pressure gas tank and additional spare parts for Dextre. Here are two videos from NASA showing the launch and the Shuttle in orbit. Endeavour’s final mission has a few Star Trek connections. The crew of STS-134 includes a real Star Trek veteran. Colonel Edward Michael Fincke, a mission specialist for STS-134, appeared as Lt. M. Fincke in the final episode of Star Trek: Enterprise ("These Are the Voyages"). Finke was also part of the "Greetings from the International Space Station" special feature for the 2009 Star Trek: First Contact re-release on Blu-ray and DVD. And last March TrekMovie reported on the special poster for STS-134 which had a Star Trek theme. 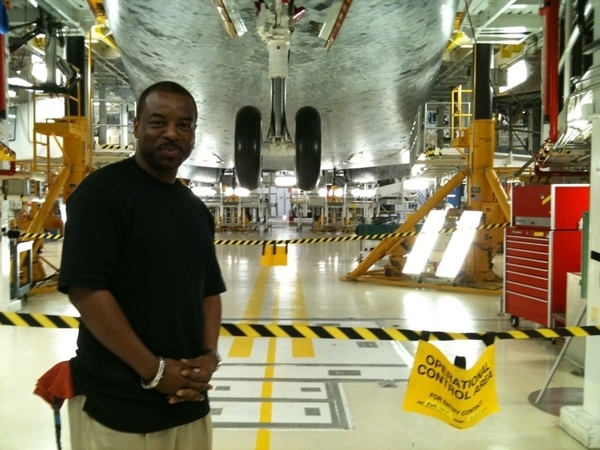 Finally, Star Trek: The Next Generation’s LeVar Burton was one of the invited guests for the original planned launch on April 29th. 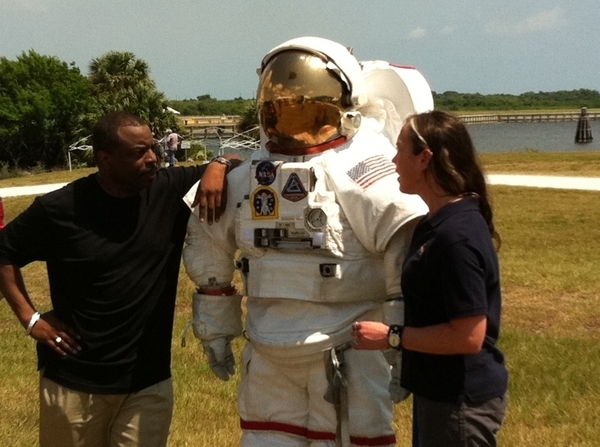 While he didn’t get a chance to see the shuttle go up, Burton participated in a NASA Livetweet event at KSC. After Endeavour returns home it will begin a new mission to educate and inspire as an installation at the California Science Center in Los Angeles. The Shuttle program comes to an end this summer with the final flight of Shuttle Atlantis. Nice poster. No females on the last flight of Endeavor? What’s that about. I thought that it was Cape Canaveral that they launched from. Endeavor is my favorite shuttle. Always like that name. That’s a fun poster. Hey Captain Mark Kelly looks more like Nero than Kirk. I keeed. I keeed. That is a great Poster. Looks like a Movie could be in store. Good Luck to those Brave Men in the Final Frontier. The bald dude looks like Locke from LOST! Some of you may remember that Michael Fincke appeared in an episode of Enterprise as an engineering crewman and even had a line. I don’t recall if Greg Chamitoff did the same, but he has cited Star Trek as being an inspiration, had some Star Trek movies with him during his previous stay onboard the ISS, and says his father told him that he knew “Capt. Kirk” from high school, in Canada of course. Endeavor’s crew is really rockin’ Trek on this mission! Sooooo…….Endeavor is 10 years younger than the rest of the fleet and has had some upgrades in the last year or two. Since we don’t have a new vehicle ready for operation, why not just fly a couple of missions a year for a few more with Endeavor? The shuttle is called Endeavour by the way not Endeavor – this isn’t just a US / UK thing it’s written on the side of the orbiter that way – an interesting exception I might add for a United States vessel of any kind! They really should add Gabby over Mark Kelly’s shoulder, to make the poster look even more Trek-ish. She’s become very much a part of this mission. Any quick-fingered digi-pros want to take care of that and post a link? And I really do hope NASA is keeping one of these birds in good shape until the next gen of ships is in service. A great article and best wishes to the crew especially Commander Mark Kelly . That’s all kinds of awesome. thats awesome! i hope they return safely home! it is sad to see our trips to space come to an end for awhile,i heard the last trip is in July. True American heroes, every last one of them. Awesome mission poster. – self correcting myself. Roberto Vittori isn’t American. So let me just say, True Heroes, Every Last Damn One Of Them! Cape Canaveral is the town and the geographical feature (it is one of the oldest geographical names in the US) , so it’s the Kennedy Space Center at Cape Canaveral. Cape Kennedy has not been used as a name since 1973. Actually, to nit-pik, the shuttles (and before them, the Apollo-Saturns) are launched from the Merrit Island base, which is not formally part of the Kennedy Launch Center (at least the last I heard, as of late ’80s). Thanks, Anthony! I’m almost as much of a NASA junkie as I am a Trekker! By the way, NASA TV has been airing interviews with the crew for several weeks which include Greg Chamitoff being inspired by Star Trek and his dad knowing the Shat in high school but couldn’t find it on Youtube or I would have sent you the link. Let’s not forget that former astronaut Mae Jamison appeared on an episode of “Star Trek: The Next Generation”. The Endeavour Space Shuttle was named after one of Captain James Cook’s ships. The poster featuring the Endeavour crew is a lot better than the “Star Trek” one it’s based on. Sad that NASA will become an organization with no goals in the foreseeable future. Unfortunate the Constellation program was axed. I stayed up to watch this one…fell asleep not too long afterward, too. But, they are fun to watch for sure. Since Endeavor was the Challenger’s replacement, I happened to be home from school the that day and watched the Challenger live as well. Even though Endeavour has a lot fewer miles on it, it’s part of an aging system dependent upon many contractors who have already moved on. The age of the orbiter airframes is not really the issue. They were each designed to fly 100 times and none of them got close to that because the system was much more complex and fragile than hoped for 30-40 years ago. NASA is still building the Orion spacecraft even though Constellation is cancelled. The question is what will launch it and when. The similarity of the NASA jump suits and those of ‘Enterprise’ sure do blur the lines of fact and fiction. I wasnt a fan of the movie poster and not a fan of the sts poster, pity the crew doesnt reflect that of tos, all nationalities. No females and no diversity, this is like some sausage fest. I like how the “Enterprise” uniforms were based on the NASA ones. It was a nice touch, adding some realness and a sense of continuity from the present to the potential future. 17… Kennedy Space Center is on both Merritt Island and the “False Cape” area at the north end of Cape Canaveral. Launch Pad 39A is on the False Cape, which is connected to Merritt Island by a causeway (the “Crawlerway”). Merritt Island is separated from Cape Canaveral by the Banana River and Banana Creek. 22… Orion was canceled in 2010. Then it was reinstated as a lifeboat only when the President was informed of the price of contract termination penalties NASA would have to pay Lockheed-Martin. Then Congress ordered NASA to continue building the original Orion but now called “Multipurpose Crew Vehicle”. Ostensibly, it is only to be a backup in case the commercial programs don’t pan out. It is to be launched by the Space Launch System (derived from Shuttle and Ares components) which will fly no earlier than 2016. The commercial programs claim dates between 2013 and 2015 for first flight. 24… There is a woman, Catherine Coleman, aboard the Space Station. I remember watch the big Saturn V push the Apollo program into space. It would almost sit there at full thrust and then finally get going. The Shuttles booster just about jump her off the pad. #24 … just the way the crew and specialists lined up this time. You always that willing to be crude to try and make your point? I am not sure how else to phrase it, the poster looks like a invasion party over a crew on exploration and peace, like some silly b movie. Im just pissed how they wouldnt announce the find of the cigar mothership found on the back side of the moon, and they pretend to look for alien life and studying stupid rocks while there are spectacular finds waiting our study on the moon and mars. Nasa already knows we not alone, just come out and announce it already. Mankind deserves to know the truth and not treated like lamb or children and told lies. What great launch footage, lol Canada arm aside, as a Canadian I still feel damn proud of what people at NASA do. Always wanted to see a shuttle launch since I was a young boy. Crossing my fingers, maybe I can get down for STS-135. Interesting how the NASA jumpsuit’s shoulders are more squared off than the one worn by the NX-01 Enterprise crewmembers’. In other words, NASA’s jumpsuit is more formal-looking than the Enterprise’s. This makes sense, since it appears that uniforms in the Trekverse have gotten more and more informal up until the red uniforms introduced in TWOK. Thereafter, they became more informal again up through the 24th Century, with the jumpsuits worn by the Enterprise-D crew. I’ve sometimes wondered why the TWOK uniforms, which reminded me of 19th Century British army uniforms, differed so radically from the uniforms worn in TMP, which looked like they were made of Lycra. The Endeavour is also the name of the main Constitution Class starship in the Vanguard books that I’m currently reading. It’s kinda cool and sad at the same time that the Shuttle Endeavour has its last flight while I’m reading about the adventures of its future namesake. I live in California so it would be cool to go down to Los Angeles and see the shuttle once it is permanently docked at the California Science Center. Great Poster!!! They should all be done like this. oh wait…. we only have one launch left before our space program ends. Never mind. Still a cool poster. Godspeed to the crew. Godspeed, Endeavour, you are spelled correctly. #35 I’m not a big Obama fan, but the cancellation of the shuttle fleet was made before O took office. #35 The real problem is “crappy” Congress and an apathetic populace. We are more interested in war than exploration. Now if they had found oil on the moon . . . .
36… Yep, President Bush and NASA Administrator O’Keefe in January 2004 (about a year after the loss of the Columbia) decided to retire the Shuttle in 2010 after the Space Station was to be completed. Congress pressured NASA to add three more flights since then (STS-125 for Hubble, STS-134 for the Alpha Magnetic Spectrometer, and STS-135 for spare parts) which extended the Shuttle into 2011. President Obama did cancel Bush’s proposed successor to the Shuttle, Project Constellation. But Constellation was a fiasco that had little chance of producing anything affordable, so no great loss. Nice video of Nasa celebrating Endeavour. I am a son of a Grummanite and original NASA specs writer from the Apollo moon missions. It saddens me terribly to see the shuttle program end and no hard plans for manned space missins in the future. I’d bet the liklihood of human exploration of Mars will be done by the Chinese. My love for Star Trek has taught me not to fear or feel anything less about that probability. The unfortunate issue with the USA no longer being on the forefront of such missions will be the likely loss of the USA being able to develop new technologies and jobs that come with them as the Apollo and Space Shuttle programs did in the past. I am not sure who “I” is, but will the Star Trek theme performed be the original Alexander Courage music or the later music, like the theme to The Motion Picture and TNG? Both are good pieces of music. NASA should leave a shuttle docked permanently to the station so the crew will have a starship to tool around in (to break the monotony of a station based show). Oh and rename it “Defiant”.